Since I've owned my Bentley, the stereo has never worked. Well not worked is not quite right. It turns on, but the tape is stuck in it, and it does not eject. It also does not play the tape, I reckon the tape cogs are mis-aligned and not spooling. I've always had to resort to just plugging my iPhone into those tiny rechargeable speakers and really it is rubbish. But I want to keep my original stereo. I really like it, even though I have never actually heard it. I like it because it's Australian. Aussie mate. As in the Clarion 9000e stereo was only delivered from Crewe in Australian cars. So in 1989 there was a total of 8 Turbo R cars sold by York Motors in Sydney, so my guess is that stereo is rare. So rare in fact, that when you Google the model number you get nothing. Well, if you search hard enough, you finally get a reference in the electronic copy of the Bentley Manual of the fantastic site RRTechnical.info site here on page 13. Something however needed to happen to get better music in the Bentley. So last time I drove to Melbourne I planned a garage evening with my brother to see if we could fix it, and re-align the tape holder. The Bentley just fit in his garage in Hawthorn. I came prepared. With a set of tools. 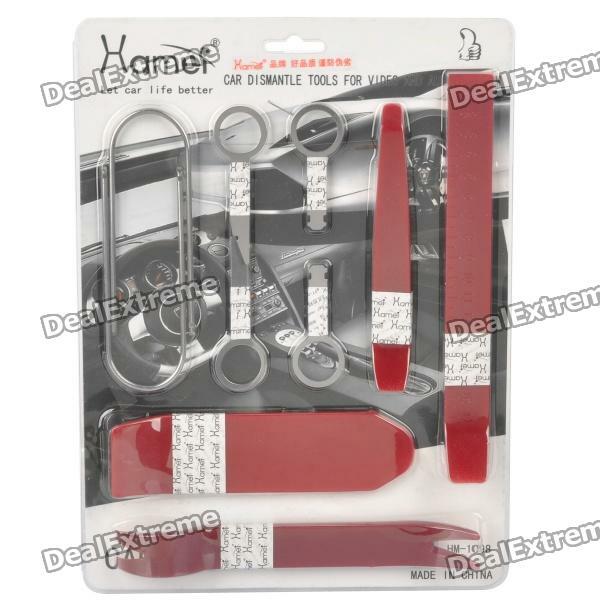 Yep, I bought car stereo and trim removal tools direct from China from Deals Extreme for USD$13.50. I always like buying things direct from China. You never quite know what will turn up, and what surprises it will bring. Here is what the packaging said "Hamei - Let car life better. Car dismantle tools for video audio system". See, that's what I want "Let car life better". So we had a go at removing the stereo to let car life better. And it still looked like this. Yep, we figured that it must be a special tool that we did not have. Let car life better could not be had that day. 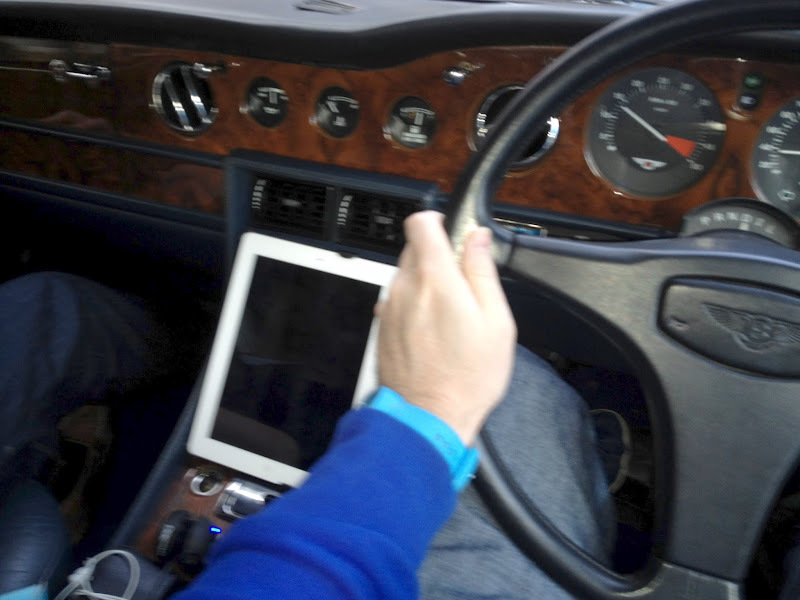 Then it was back to listening to the iPhone on loudspeaker, which is not really befitting of a Bentley driver. I then started to take a good look around at the options I had. I was ready to get creative with the input sources and toys for driving. But creative in a way where they are not permanent. That is the issue with adding technology to cars. Technology is always such in that moment, because we all know six months later a new thing will be release and it will have more bells and whistles. 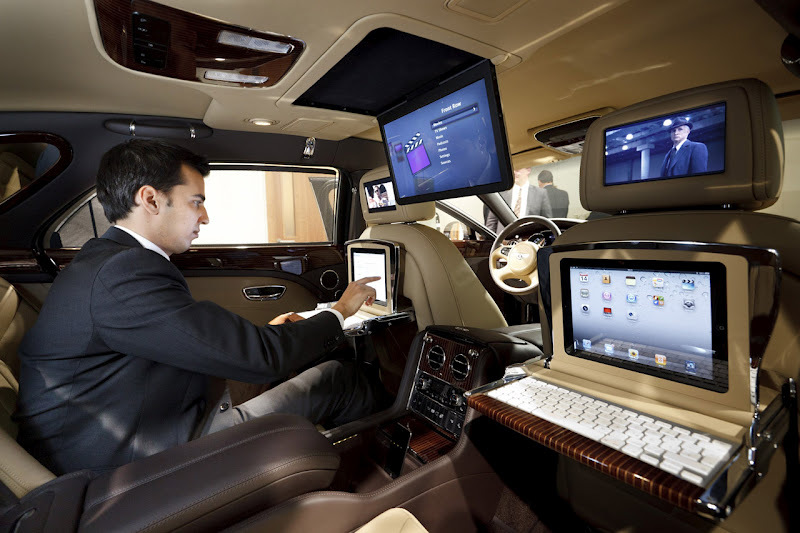 That's why I smiled when Bentley came out with an 'Apple integration' and installed permanent iPads in the rear seats. Well as predicted in 6 months a new iPad was released and this was old technology. So I decided to go with removable technology which you can constantly update. So here is what I've been thinking. I like to have my phone hands free to the side as seen in this video of me driving up Black Mountain. It works well. For long trips and club events I like to run driving apps on my old iPhone, as well as still use the Tom Tom Navigation. Sometimes there is also my Contour GPS logging POV video camera up there as well. They also look pretty cool in the dark. The iPhone apps also have 'HUD' as in Heads Up Display which is also cool. I keep using the Tom Tom when I feel like it, as it has red light and speed camera alerts, and I have not found a good Aussie app for the iPhone to do that yet. The turn by turn voice commands were also useful, before Google Maps app was released of course. But having something in the centre console would just look cool. And you know it's crying out for an iPad. Next to the ejector seat button. Here it is in white. It's just that little bit too big for the console. It covers the clock, volt metre and outside temp gauges, not to mention the book matched wood. It's also a little in your face. So the next option? iPad mini is the logical option. I think this works very well. You can see the other gauges, does not look too offensive, and only covers the town or country horn switch and the hazard lights indicator. I could live with that. But not too sure of the white. Despite what it looks like, I've not actually an Apple fanboy. I use a PC. So I also had a look into the Raspberry Pi mini computer, mini android devices and Parrot bluetooth modules as input interfaces. I like the Parrot company, quite innovative in fact. They are French, have used one of my favourite designers Phillipe Starck to design speakers for them, and have come up with Android apps for their car stereo head units. However the apps are crap for Australia, but their bluetooth hands free kits are quite cool where I could pair the iPhone to it to listen to music, definitely an option. So after mulling around and procrastinating about doing something because I liked my broken stereo, I finally decided to speak to the professionals. Pretty much only because I could not work out how to remove my old car stereo, and I wanted a quote to get it fixed. More importantly, I wanted to know if my old stereo had an Auxiliary input, so I could hook up a bluetooth module to it and keep the car original. So after some Googleing, there are 3 car stereo shops in the Australian Capital Territory. I'm amazed that car stereo shops still exist. I buy most things from the Internet. But if you can't work something out yourself, it is nice to ask pros. Two of the shops are part of the 'Car Audio Masters' collective and the other is not. So I just had to go to the truly independent Aussie owned car stereo shop, after checking them out in depth of course, on internet forums and taking a look at their work. 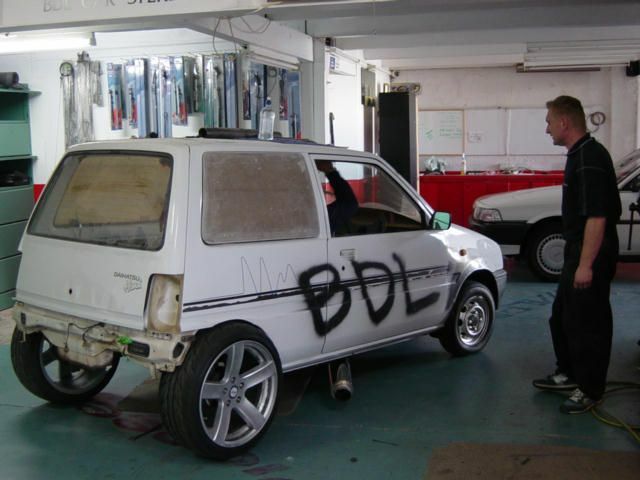 The shop is called BDL Car Stereo. I also like it as it's in the suburb of Fyshwick. This is funny for Australians as that's were you go for p0rn, fireworks and prostitutes. So I had to go. I had actually been there about a year ago to take a look around when thinking about options. From checking out forums the pros were Wassa and Zach. That's Warren and Zachary to non-Australians. 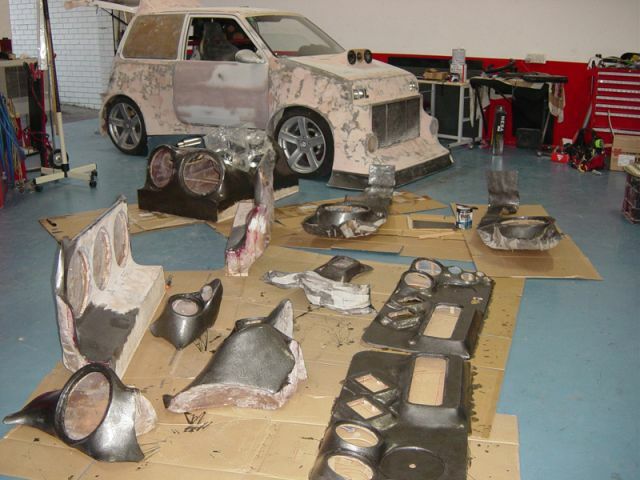 Research also indicated that the shop was also creative, and I liked their custom installs and use of fibreglass. And they are a bit mad. Check this out. What a piece of automotive magic. Add a good dollop of creativity and fibreglass and not much common sense. Then you get this amazing outcome. I don't like it, but I really like that they did it. It's mad and does not made sense. I don't mind seeking advice from them. Bloody hell, I have yellow wheels on my Bentley. So, this is what I wanted to repair, the Clarion 9000e car stereo as installed in Bentley and Rolls-Royce cars delivered to Australia only. And also to find out if it had an auxiliary input, to input from any source for amplification to the speakers. By the way, I did check the interface to see if it had an aux input, but could not work it out. So at the BDL Car Stereo shop, Zach remembered my from a year or so ago and was very pleasant. I quite liked this. I decided to play the dumb card to see what he would recommend to me. We spoke of the possible repair of the Clarion 9000e, and he informed me that they send them to Sydney or Melbourne and it can be quite expensive. He mentioned that a Mercedes stereo from the 80s was repaired and cost $1200. That was a little bit more than I wanted to spend without more research. So we spoke of the Parrot units, and the potential to just buy a separate amp to power the speakers with a bluetooth module direct to the amp from an input source. I was too embarrassed to say I was only there because I could not work out how to remove the stereo in the first place. Another option was a temporary head unit, whilst I did my research to get the original one repaired. This was beneficial to me as I would get the pros to take the stereo out of the car. There was the Parrot bluetooth option with a separate amp as well, but the recommended retail was $699, so too much for something I did not actually want. So after more chatting, it was a look at the options. One of my requirements was I did not want to buy a CD player. CDs are old, and not of the technological moment and would date the purchase. I have also not used CDs for years. All I wanted was an amp for my factory speakers with options for external inputs, including wireless. Then there was this. The Pioneer MVH-355BT. It did not have a CD player, had multiply inputs, and actually used the Parrot bluetooth technology from Parrot. It was not too powerful as well, at 4 x 50W RMS as I did not want to blow my factory speakers. It also happened to be the cheapest head unit they sold at $199 retail. It was a pretty easy decision. $199 is a tank of petrol and a bottle of Chivas Regal. Or music in the Bentley to "Let car life better", as the Chinese tools instructed. Installation was $100. I though that was reasonable. I though for a moment to haggle on price, but decided against it. Yes, I could have bought the head unit from overseas for say $50 cheaper, waited a few weeks for it, then been embarrassed because I could not install it. I also wanted to patronise these guys, as their crazy car stereo creations had made me smile. I'm pretty sure Zach thought I was a bit mad. A guy comes in in a Bentley and buys the cheapest car stereo in the shop. That guy surely should have been driving a Rolls-Royce! I also liked it, because I played the dump card that I actually knew a lot more than I was letting on. So here it is. Yep, it looks ugly, and I want my old stereo back there. I don't actually like the look of it at all. But I have a solution to the problem! A black iPad mini. Check out the finished product. I think it's cool and of the moment, and hides the head unit. The Parrot bluetooth technology is quite cool. When you turn on the car, it just starts streaming the music from your iPhone from where it was last time. That means from the tunes on the iPhone, or Pandora, or Last.FM, or a webcast etc. It just works. You don't actually have to do anything, except turn on the Bentley, and you have music playing. I like it a lot. Here is the iPad running Google maps, and any app I want. Just what I wanted. And the real reason of what I wanted. To take the old stereo out to send off to get fixed. Here it is. I loved it when I first saw it removed. Did you guess it? Check out the masking tape with the very well written 26160. Yep 26160 is the Chassis number of my Bentley. How cool is that! The men of the Rolls-Royce and Bentley factory of Crewe certainly do care about detail. And the Clarion 9000e does have an Aux input, so it will fix my purpose when it is repaired. I'm a happy camper. With Tunes in the Bentley. Thanks again to BDL Car Stereo for taking my stereo out, and installing the temporary unit. Now, does anyone know where I could get my original head unit fixed? Thank you for a great report. I love reading best practices and custom solutions to get our cars up to date. You mentioned Parrot a couple of times and that’s my solution. Built in Bluetooth, GPS navigation, hands free, streamed pod radio, mp3 player, Spotify, you name it. Even though I think it’s a flaw not seeing the original Rolls-Royce car stereo panel; I prefer to have my RR with contemporary features. This is how it looked when I replaced the Parrot logo with the RR logo. The RR’s even glows when it’s dark, just as all the other white parts on the panel.